Here is the article and content sent to me by mail. Syama Sastri, (1762-1827), is known to the world as one of the great Trinity who raised the monumental edifice of Carnatic music. But he is also known to me as my grandfather’s great-grandfather. And it is this unique personal link that enables me to share with the outside world some facts about him, that are not generally known. There is the story, for instance, of the above portrait of Syama Sastri. It is an original portrait that is in my possession, and it is the only original from which all published portraits have been derived. On the 7th. February,1827, seven days after his wife dies, he knew through his knowledge of Astrology, that he had reached the last day of his life. This prompted him earlier that day to send for a friend of his who was a good painter, and ask him to draw a portrait of himself. His friend agreed and commenced the portrait. But after drawing Syama Sastri’s face, his friend decided to complete the portrait another day. Little did he realise that this was not to be, as Syama Sastri would pass away later that day, and the picture would have to be completed from memory later. The original portrait so completed is reproduced above, and has suffered fading and erasure in parts in the centuries that have since gone by. But what is of interest here is that the small original drawing of the face has been stuck on a larger sheet on which the rest of the detail have been added. The original drawing can be seen clearly demarcated as a rectangle on the portrait so completed. Those who may have been initially surprised that I should have chosen to illustrate this presentation with a portrait of such poor quality, will now see the reason for it. Where did Syama Sastri draw his musical inspiration from ? It was from the Goddess Kamakshi who resided in the sanctum of the Kamakshi temple in Thanjavur, who resided in the small icon of Kamakshi in the Puja room of his home, and resided also as a living presence in the sanctum of his own heart. If the music that he bequeathed to Carnatic music had a divine quality, it is surely because he drew inspiration from this divine source. So complete was his devotional surrender to Kamakshi, that he became but an instrument, a musical instrument, in Her Divine hands. To this personal diety Syama Sastri offered his every day prayer, much of which centered around the Sri Vidya Upasana, an ancient and massive Vedic composition. To bring it into a shorter time-frame for every day worship, he composed an abridged version and recorded it in his own hand in the Grantha script on a palm leaf manuscript, comprised of 42 leaves which is today in my possession. An image of the first leaf with a transcript of the text in Grantha and Devanagari is reproduced above. In South India today, no musical performance is complete without a rendering of one of his compositions, where devotion, melody and verse combine to provide an elevating experience. He composed more than 300 songs, mainly in Sanskrit and Tamil, and also in Telugu , the language of his fore-fathers who came from the Andhra and settled down in Thanjavur. He wrote his songs also in his own hand on palm leaf manuscripts. I have had the good fortune to inherit one of these manuscripts, containing the text of many of his compositions. I reproduce below the image of the leaf carrying the very first song he composed, together with a transcription in Tamil. He composed this song impromptu in the course of his daily prayer. Perhaps he did not intend it as a conscious composition, which accounts for the absence of his “Syama Krishna mudra”, or signature, which appears in all his later compositions. Some later versions of this composition also carry this mudra, and may have been added by later disciples perhaps to conform to the convention of affixing the mudra at the end of every composition. Here the mail content comes to an end..
For the past four days I had been singing the Yadukulakamboji Swarajathi composed by the great Vaggeyakara as a ritual and praying to Goddess Kamakshi . As an answer to my prayers, I saw this mail in the inbox which I do not know whether it is a coincidence or a direct blessing from Goddess Kamakshi and the Great Vaggeyakara Himself! I feel that I am Blessed and my prayers heard ! Though I do not know Telugu, I try to learn the meaning of the krithi so that I can render it with utmost faith and devotion, just as the meaning of the composition begins with. Conveying my heart-felt thanks to the descendant of the great vaggeyakara Sri. Syama Sastri and to the good souls who forwarded this article , which reached me when I wanted HER Blessings the Most. Lastly, I do not know whether the above portrait and images of manuscripts are copyrighted. So cannot guarantee how long this article will be here in this blog ! wow Anuradha! A great article and your observations in the end are so heartening.. Yes.. what else can be the best and easiest way to the Divine heart than Music and the treasure houses of compositions by our Vaggeyakaras? A treasure indeed.Thanks many Anuradha Madam. blessed to receive this mail from you. Visit sangeethapriya.org and download as far as possible. Here in this blog I have not posted any collection of Syama Sastri Compositions. very informative and enjoyed reading it. thanks. I don’t no raagas but i have music sence. your article is good, which gives your fore grand father’s work & contribution to music. like you if everyone think about their fore family members indian family culture never dies. I am neither a musician nor a magician to comment on your articles in general and this article in particular. U are both. I am mesmerized by your expressions in all articles blogged by u. . I feel better u publish books on each item or compendium of your atticles. Why cant you provide youe phone number so that I can discuss with you many doubts in my project on Raga Kosha in karnataka Music. Please remind your friends in music world that there is no Karnatik music and it is age long system called karnataka Music which mabe Sri Purandaradasar karnataka sangeetha Pithamaha and not karnatik Sangeetha Pithamaha. Ask not to insult the system. founded on well established principles of culture and heritage and not a geographical area. It sprouts out of karnataka Sangeetha samrajya (Kingdom of Karnataka Music). and from a language of anybody but from the sacred language of music. I will be able to elaborate if we meet sometime when you visit Bangalore as proposed by you or I should visit Kerala for the purpose. Madam, I am overwhelmed to see an article of Sri. 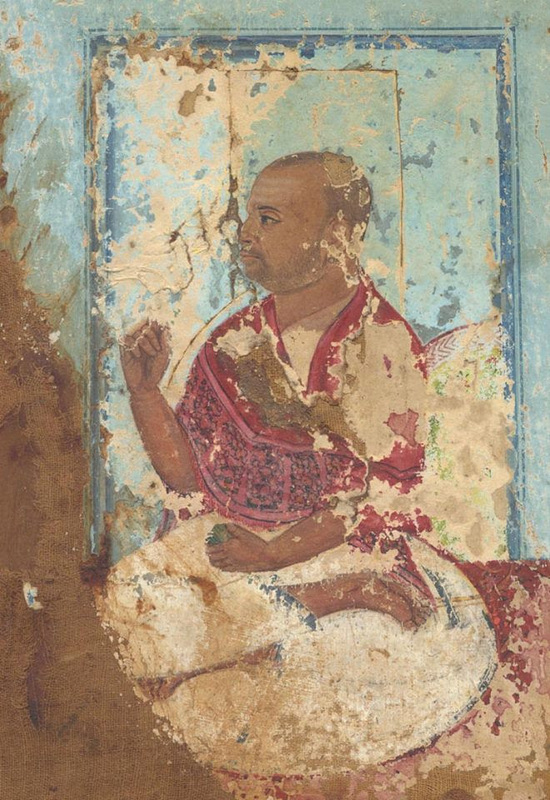 Shyama shasthri and your efforts to display the rare portrait to us. It would be of greater help , if u can guide me to contact the author of the mail who has those manuscripts so that I will feel blessed atleast to see those compositions. Unfortunately I do not have the mail id of the descendent of Sri. Syama Sastri. It was a forwarded mail that came to my inbox. I have already asked him. The reply was that was only a forwarded message that came to him. Respected Anuradhaji, Your blog is expansive and extremely informative. Amazed at the wealth of information that you have shared. Humble Pranams. Vijay Natesan, Mridangam Artist, Chennai.